Photo Courtesy/ Alison Wieder The plays performed have different themes, yet will have a strong impact on viewers. With the new semester starting, there is already plenty of events occurring on campus. Some of the upcoming events include two plays, “Godspell” and “A Doll’s House”. “Godspell,” directed by Dr. Ball, is a new take on stories from the Bible, and is best told through the eyes of those performing in it. “It is about Jesus getting others to tell his stories so they can understand what he wants for man,” said Rashik, a Music Theater Major. The students in the play are eager to have people come out and see it and say that even those who are not religious will still get a lot from the show. “[The Play] shows people coming together as one, and working together as a community. 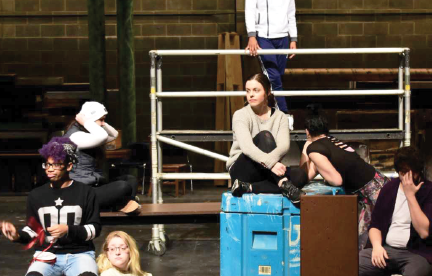 That’s what the root of the play is, coming together to build and grow together to become one and work together as a unit,” said Theater Major Marcell Mackenzie. “Godspell” is not your typical gospel play, because it is set in modern day New York and has upbeat music that will surely move the audience. The showtimes for “Godspell” start Feb. 28 and run through March 4. The other play this year is “A Doll’s House” which is directed by Susan O’Hearn. The play discusses an issue society still faces today, and that is the role of women and men in marriage. The main character of the play, a woman named Nora, secretly borrowed money behind her husbands back and has been working in secret to pay off their debt. All of this was happening in a time where working women are still mostly being looked down upon. Although this is not the exact situation today, women are still fighting for equality in the work place. “A Doll’s House” will run through April 17-21, and have another showing on the 22.